Run for the first time on a Sunday, racegoers were treated to a thrilling renewal as Philip Hobbs' charge was a sight to behold at many of his fences, though he had 7-4 favourite Eduard for company at the business end as the pair jumped two out together. Nicky Richards' market leader looked like he might have the upper hand coming to the last as he held a narrow advantage, but he was not totally fluent and Richard Johnson and Wishfull Thinking (13-2) rallied strongly to surge to the front for victory by a length and a half. 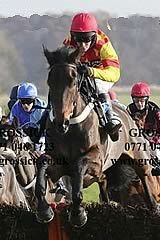 Johnson said: "This is a horse that stays very well and he gave it 110 per cent. He got done for speed the last day but jumped lovely here and I think he is as well as he's ever been, despite being 11. He's so much more relaxed nowadays." Delighted owner Graham Whateley added: " I hoped he would do it today - we had a third in this race last year with Captain Chris, which was a bit frustrating as he had so much weight. "I hope he will have a long rest now and then we will have a think, as I think he might be better in the spring. Hopefully the ground is good for Menorah on Boxing Day (King George) and then he (Wishfull Thinking) could come back in January or February." 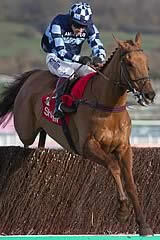 Coral gave Wishfull Thinking a 14-1 from 20-1 quote for the Ryanair Chase at the Cheltenham Festival. Richards was left to rue the mistake at the last by Eduard and said: "He's run a nice race and I don't think there will be many people on the racecourse who would disagree that he would probably have won if he had gone and jumped the last a bit better. "The race has been won by a grand horse, but ours is a young horse and if he'd winged the last he'd have won it for me. He's still on a learning curve, it's only his third race really at a good level and we'll have to regroup."